This article is meant to assist you with the details in Adding and Maintaining Program Reports. 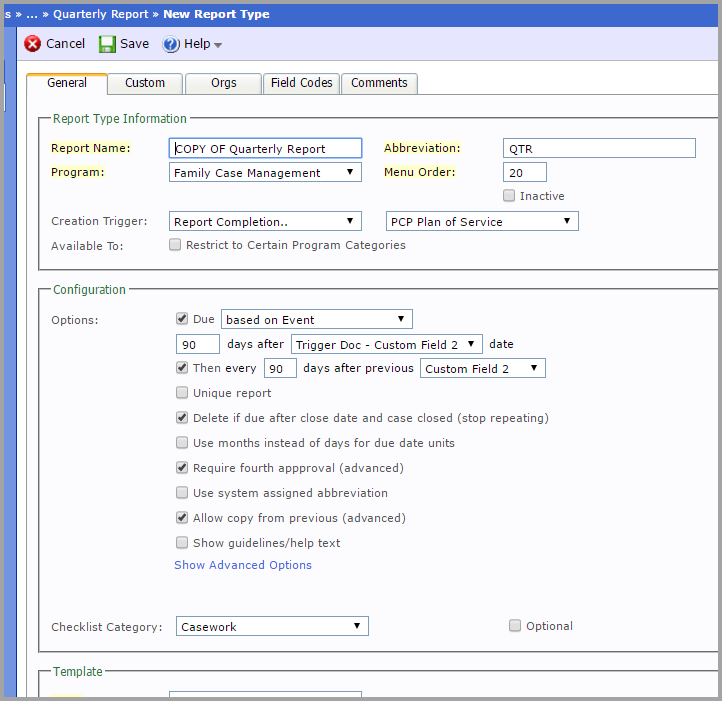 Program Report Types control your list of available Reports within a particular Program. Reports are typically documents that are either collected or generated/written by your staff, and often have a due date and an associated file. Examples of Reports are written documents, such as service plans or assessments, or collected documents, such as birth certificates or social security cards. You must be an Agency Administrator to access the “Administration” menu on the left side of your Workspace. Go to “Program Settings” and click on “Program Report Types”. 1. 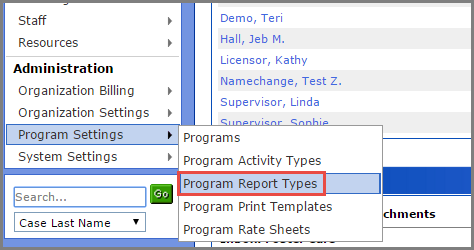 Once in “Report Types”, select an existing report from the list or create a new one by clicking “Add Program Report Type”. 2. If Cloning a Report Type, click on “Clone Report Type” within an existing Report Type. 3. If editing an existing Report Type, click on “Edit”. 4. Within the General screen, complete the fields. Required fields are highlighted, while optional fields are not. 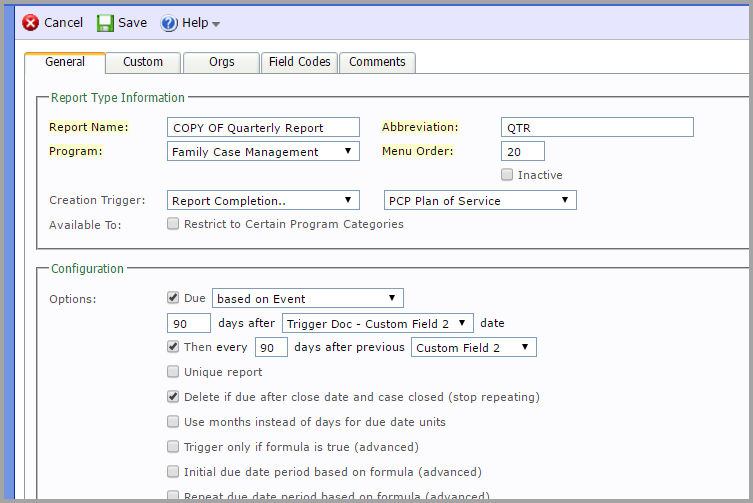 Organization A drop-down menu will be available, if this is applicable to your agency. Create Trigger(s) If you would like a report to be triggered based on the occurrence of another event, you can select one of these options. See Due Dates in Related Topics for more detail. Inactive Only inactivate if you no longer wish to use this activity type. Options Should you check a box, the eR system will adjust your subsequent box options. Due For more details on Due Dates, see Related Topics. Unique Report (1 per case) This advanced rule is available if you click on “Show Advanced Options” at the bottom of this list. Delete if due after close date and case closed. Stop repeating. Trigger only if formula is true. This advanced rule is available if you click on “Show Advanced Options” at the bottom of this list. Initial due date period based on formula. This advanced rule is available if you click on “Show Advanced Options” at the bottom of this list. Repeat due date period based on formula This advanced rule is available if you click on “Show Advanced Options” at the bottom of this list. Requires fourth approval This advanced rule is available if you click on “Show Advanced Options” at the bottom of this list. Custom approver labels This advanced rule is available if you click on “Show Advanced Options” at the bottom of this list. Require follow-up with client after completion This advanced rule is available if you click on “Show Advanced Options” at the bottom of this list. Allow copy from previous This advanced rule is available if you click on “Show Advanced Options” at the bottom of this list. Allow for the collection of client signature(s) on-screen This advanced rule is available if you click on “Show Advanced Options” at the bottom of this list. Requires proof reading This advanced rule is available if you click on “Show Advanced Options” at the bottom of this list. Specify involved participants from people tab This advanced rule is available if you click on “Show Advanced Options” at the bottom of this list. Specify number of total participants and first-time participants This advanced rule is available if you click on “Show Advanced Options” at the bottom of this list. Use advanced form builder This advanced rule is available if you click on “Show Advanced Options” at the bottom of this list. Content Controls: Do not copy named Content Control Values when generating this report This advanced rule is available if you click on “Show Advanced Options” at the bottom of this list. Content Controls: If no prior Report Type found, copy named Content Control Values from another Report Type This advanced rule is available if you click on “Show Advanced Options” at the bottom of this list. 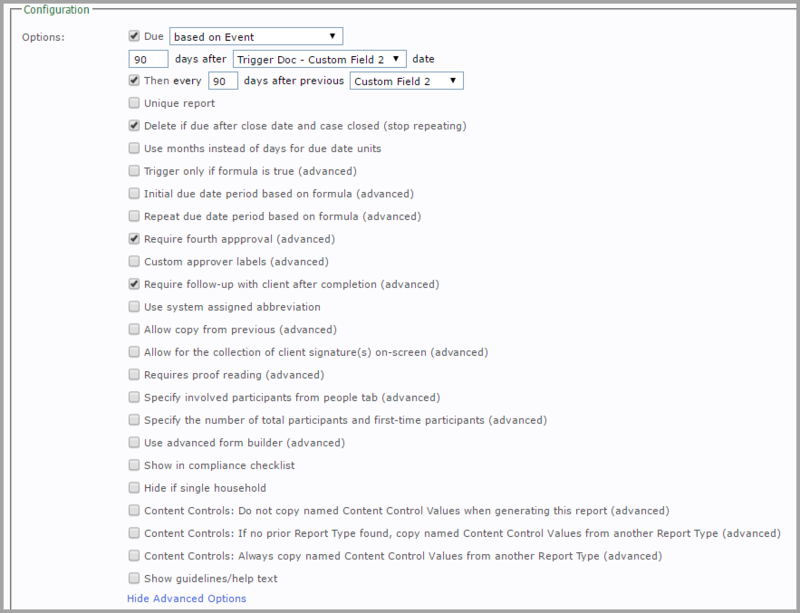 Content Controls: Always copy named Content Control Values from another Report Type This advanced rule is available if you click on “Show Advanced Options” at the bottom of this list. Type Always use “File – Use Field Codes” when you are adding Field Codes in this Report Template. Attachment Icon Click on the paperclip to attached a MS-Word document(s) if you selected a “Type” (from above) that includes attaching a document. Narrative Add the narrative with Custom Field Codes, from the “Custom” Tab, if you wish. For more support regarding Custom Fields, see Related Topics. This narrative will appear when you access this Program Report in the eR system. 6. Report Type Complete and Usable*. Your new report is now accessible from your Workspace within a program, and usable in your agency’s workflow.